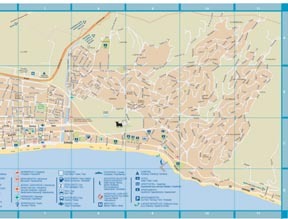 This map shows in detail the main places in Fuengirola so you can find them easily: taxis, petrol stations, bus station, train station, chemists, monuments, markets, public parking, hotels and apartments. Bare in mind that some of the signs may not be updated, you can click on the different areas of the Fuengirola map to enlarge them and see them in more detail. 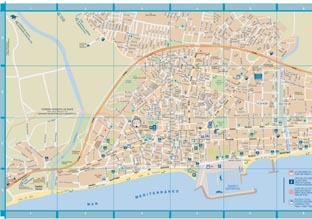 As you can observe on the map, and as we previously explained in another section about Fuengirola's history, the urban core of this municipality extended from the eastern side of the Fuengirola river (when originally the settlements before the Christian invasion were located on the opposite side of the river, where they built the castle). The N-340 that passes through Fuengirola will be our way in and way out of this municipality if we go by car. In the westernmost part of Fuengirola we'll find the Sohail castle and on the eastern side, Carvajal. Fuengirola has lots of interesting places to visit as well as stunning monuments and we hope this map is useful to you, to be able to find as quick and easy as possible whatever you are looking for. Fuengirola is fifteen minutes away from Malaga airport. It's an interesting place for young people and family-oriented travellers. There are long beaches where you can find typical 'Chiringuitos', and get relax in lounge chairs and pedal-boats. At the far end there is a windsurfing school. Rooms are difficult to find in August, so make your reservation some months prior your travel to Fuengirola.